Be the first to share your favorite memory, photo or story of Gene. This memorial page is dedicated for family, friends and future generations to celebrate the life of their loved one. Gene A. Gerhardt, 82, of Niota, Illinois passed away at 8:45 p.m. September 11, 2018 at West Point Care Center in West Point, Iowa. He was born on March 20, 1936 in Niota, Illinois, the son of Walter and Helen (Morrill) Gerhardt. Survivors include: one son: Greg Gerhardt (wife: Rinskje “Reny” de Leeuw) of Nicholasville, Kentucky; one sister: Darlene Hartweg of Hamilton, Illinois; his former wives: Violet Gerhardt-Williams, Sherry Diaz, and Virginia Gerhardt. Also surviving are several nieces and nephews. He is preceded in death by his parents; daughter in law: Paulette Gerhardt; sister: Bonnie; and brother: Bill Gerhardt. Gene was a graduate of Nauvoo High School. He was a lifelong farmer and an avid horseman. Gene had a special talent with horses and enjoyed training and riding. He was a champion Western rider and enjoyed fishing here in the states and in Canada. 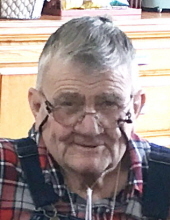 Gene was affiliated with Appanoose Faith Presbyterian Church. His body has been entrusted to Schmitz - Banks and Beals Funeral Home for cremation. A Memorial Service will be held at 3:00 p.m. Saturday, November 10, 2018 at Schmitz - Banks and Beals Funeral Home in Nauvoo, Illinois with Pastor David Poland officiating. Burial will be at Nauvoo City Cemetery, Nauvoo, Illinois. In lieu flowers a memorial has been established for the Brain Restoration Center in care of Greg Gerhardt of 105 Parker Lane, Nicholasville, Kentucky 40356. Schmitz - Banks & Beals Funeral Home in Nauvoo is assisting the family with arrangements. On-line condolences to the family may be left at www.sbbfuneralhome.com. To plant a tree in memory of Gene A. Gerhardt, please visit our Tribute Store. "Email Address" would like to share the life celebration of Gene A. Gerhardt. Click on the "link" to go to share a favorite memory or leave a condolence message for the family.